Local writer Jeremie Samuel points out Moorish architecture in Pensacola, Florida…“Discover hidden treasures of culture in Pensacola through the Moorish Essence of America’s first port city.” The Moorish Essence of Pensacola indulges in the rich history of exploration and cultural exchange in the port city. 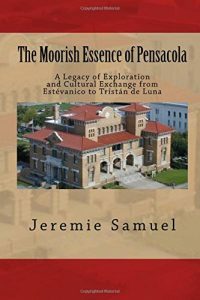 Jeremie Samuel, the author, born in Pensacola, analyzes the congruent climate and ecology which cultivates Pensacola in the likeness of Moorish Spain and Morocco. Explorers embarked in quest of the rich territory of Pensacola and Estevanico the Moor, born in Morocco reached her shores in 1528. The Moorish Essence of Pensacola also manifests through the Spanish explorer, Tristan de Luna, who landed at Pensacola Bay on August 14, 1559. He was born in the Moorish province of Borobia in Northern Spain, and 100 Moors were in his fleet on the expedition to Pensacola. The layout of the city’s main districts of Cordova, Seville, and Granada correspond with the great, ancient cities of Cordova, Seville, and Granada in Moorish Spain. Carl here in Morocco for the next two weeks. Do you have any suggestion on where to begin to search for Estevanico the Moor, born in Morocco? I have several of free time and would like to spend that time locating the manufactures of original Fez and any original Treaties. Heading to the Counsulate tomorrow for general information on trade, Real Estate Development and general opportunities to export products to the US. Ilive in Miami and will be continuing the study to restore my status..
305-225-5633 after May 20th. In Morocco for Real Estate Development deal. 2400 units of work force low cost housing.